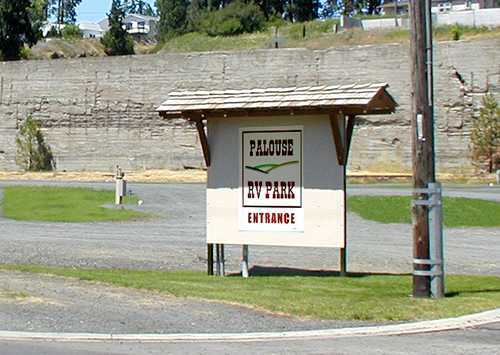 The Palouse RV Park offers full hookups with 10 sites right across from the Palouse’s Hayton-Greene Park, and 3 blocks from Palouse’s historic downtown. Located just 20 minutes from Pullman, Moscow, and Colfax along the Palouse Scenic Byway, the Palouse RV Park is the ideal spot to stay when visiting the Palouse. Q. What is the largest RV you can accommodate? A. Spaces 1-5 are back-in sites and accommodate up to 60 ft. Spaces 6-10 are pull-through sites and accommodate up to 75 ft. 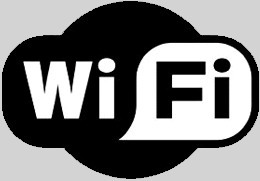 Call City Hall at 509-878-1811 (M-F, 8-5) and pay with credit card or in person, M-F, 8-5 at City Hall, 120 E. Main St. with cash/check/card. Q. Can I pay for my stay upon arrival? A. Yes. But only prepaid reservations are guaranteed. Any available sites are first-come, first-serve. Always first check the reservation sheet and second call 509-878-1811 to confirm openings. There is a self check-in form and drop box at the site. Q. What are the rental rates for the RV Park? A. The current rate is $30 per night, including tax. This rate includes your overnight parking, water, sewer, electric, garbage, wi-fi, and use of the city pool (seasonal). Q. Is there a weekly rate? A. Yes. Guests staying 7 consecutive nights, pay $180.00 instead of $210.00. Must be paid in advance to get discount. There is no monthly rate. Q. 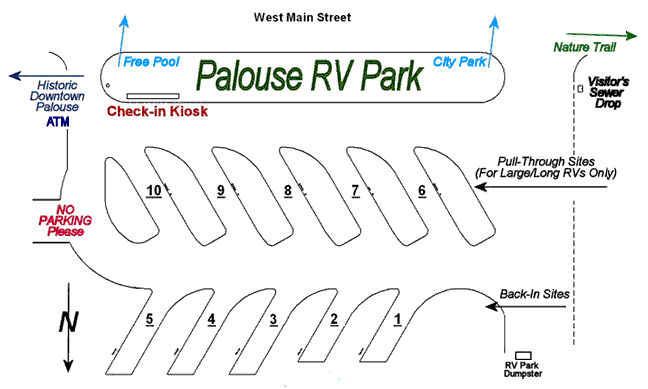 What is the maximum length of stay allowed at the Palouse RV Park? A. Three sites have a maximum stay of 28 days (6/12/12 minutes). The remaining seven sites have a maximum stay of two weeks, with possible one week extension with permission from City Hall. A. Check-In is 2:00 p.m. Check-out time is 12:00 noon. Q. Are pets allowed in the park? A. Yes. There is a limit of 2 pets per site. The city has provided pet waste bags for your convenience. Pets must be on leash outside of your campsite, and under your control at all times while on campsite. A. One tent allowed at site with paid RV. No stand-alone tent camping. Q. What is the power capacity at the site? A. Each site has a 50amp 220v, 30amp 220v, and 20amp 110v outlet. Q. Is there potable water at your location? A. Yes. 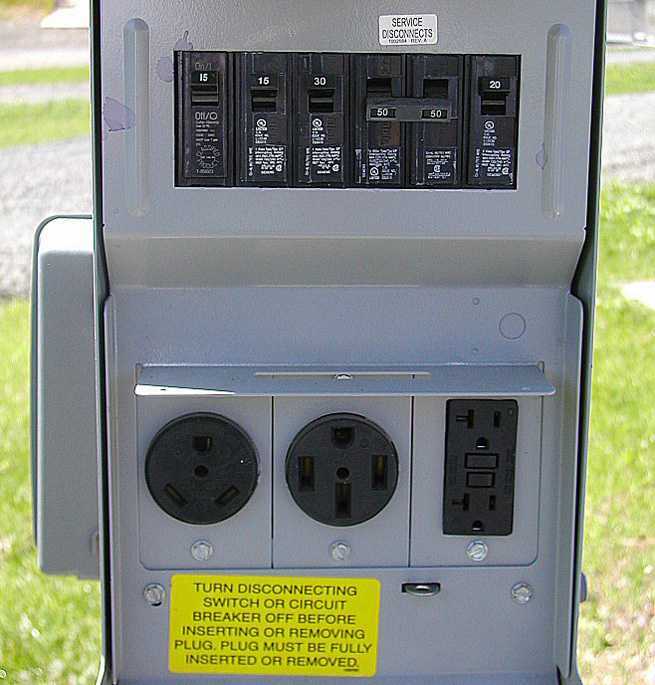 The RV Park is connected to the city’s fresh drinking water system. The water pressure at the site can be over 100PSI. Use of an internal or in-line water pressure regulator is strongly recommended. Q. Are there services close by? A. Yes. Palouse downtown is just a few blocks to the east with restaurants, grocery, health, and auto repairs. There is a gas station (credit card only) two blocks to the east as well. 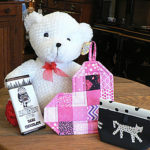 A Palouse Chamber of Commerce business listing can be found at www.VisitPalouse.com. 10:00 p.m. to 9 a.m. Please note the reservation sheet to check availability. Always double-check availability by first calling office at 509-878-1811, M-F, 8-5. Only prepaid reservations are guaranteed. Advance reservations take precedence over drop-ins. Failure to pay will result in immediate removal from all city services, regardless of temperature/time of year and RV is subject to impound at owner’s expense. City assumes no liability for damages incurred as a result of any actions taken and all expenses are at owner’s expense. Premium weekends require a two-day minimum reservation. Premium weekends include but are not limited to WSU Homecoming, WSU home football games, WSU graduation, WSU Mom’s & Dad’s weekends; Memorial and Labor Day weekends. 48-hour advance notice from 2:00 pm check-in time is required to cancel a site reservation for a full refund (minus a cancellation fee of $5.00). No refunds or credit for days left early, so please plan your stay accordingly. Limit of 2 pets per site. Please clean up after your pet(s). Dogs must be under your control at all times. One tent allowed at site with paid RV. No stand-alone tent camping. Campfires in portable fire pits on gravel only or in public fire pit at Space 1. Portable grills are allowed, though they must be kept a safe distance from other campers. One RV and one tow vehicle per space. Vehicles must fit completely into space. Vehicle maintenance in the RV Park is prohibited. Lot area must be kept clean and free of debris. Occupants are responsible to leave site in good order. The City of Palouse and its employees assume no liability for loss or damage to property and injury to his person or party arising out of use of its facilities or caused by others while on the premises. Fireworks are not allowed in the park area. Renters and all other users of this property are liable for all property damages. It is the liability of park user(s) to protect pipes/hoses/property from freezing temperatures. The City of Palouse and its employees assume no liability for damage to property arising from freezing temps. Use at own risk. Guests who cannot abide by the above rules or who participate in any illegal behavior will be asked to leave the park immediately. Management reserves the right to refuse service to anyone. If city ends your reservation, refund will be given for unused days. RV Park Rules and Policies are subject to change. 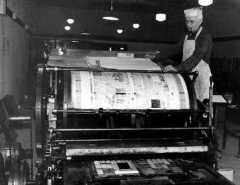 All complaints shall be signed in writing and submitted at City Hall (120 E. Main Street). Hookup photo – Click to enlarge. The Palouse City Code prohibits human habitation of recreational vehicles outside of mobile home parks, however, a policy has been designed to allow friends and relatives to visit and use city water. This policy allows this to occur without additional cost only at a residence, only for periods of 29 days or less in any 12 month period, and only for water service. Under no circumstances is it ever legal to connect a recreational vehicle to the city sewer system outside of a mobile home park.